This book sounds disgusting and delightful. I now have some burning questions that need answers. Sign me up for the giveaway! Oh, sign me up for this one for sure! I would surely impress my 21 year old son and his friends with facts from this book. oh wow! I grew up with only one brother, and now I live in what I call a “man house”, since I have two sons (no daughters) and a husband. I NEED this book!! hahah. Thanks so much for the giveaway!!! What an interesting book. I am sure my teenage nephew and his friends would enjoy it. This sounds rather interesting, probably won’t read it while eating though! Gosh, how can I pass this one up! 🙂 Put me in the hat! Oh, enter me too, please! I actually did know the skin cells/dust thing, and I heard somewhere else that the other main component of dust is tiny bits of burned-up asteroids. I have absolutely no idea whether that’s true or not, but I like the idea that when my house gets dirty, it’s actually full of shooting stars. I also knew about the skin/dust thing, which is just so crazy to me. This definitely sounds like one interesting book! Sign me up!!! Please enter me, this book sounds extremely entertaining. I also knew that 80% of dust was dead skin – one of my high school friends enlightened me a few years ago, LOL. I could always use more useless information. I’ve also posted about the giveaway in my latest giveaway post! OH man, my kids would LOVE this book!! Sign me up! What fun this book would be! I have a know-it-all son-in-law I’d like to spring some info on! 😉 Thanks for the chance! Who can resist gross factoids? Count me in! My kids and I would love this one! LOL Thanks for a great giveaway! This sounds so gross! My nephew would love it! Thanks for the chance! Please enter me too! I love to read about weird, gross and strange things..lol. Thank you! I have a 7 year old. This is a must read! Count me in, too! 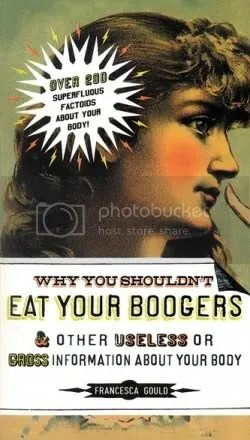 Gotta love a book about gross body facts. My nephews will love me. LOL!! 🙂 sounds very interesting. Fun. I hope I’m picked (in keeping with the whole booger theme), just please don’t roll me up into a little ball and wipe me under the sofa. Please enter me into this er interesting book contest! I’d love to win this book and the gift card, too! What a cool book! My kids would love this one! This book could prove interesting. Something I’d like to check out. Please enter me, and thanks. My boys would love this book. Please throw my name in the hat! Better almost too late than never! Sounds like an interesting book! I don’t read a lot of non-fic, but this one will go on my wishlist. I think my son will get a kick out of it too! !